As news of the fire broke, several teams and players expressed their condolences on Twitter. "This is the worst tragedy to happen to the club in its 123 years". The fire was reportedly controlled at around 7:20 a.m. 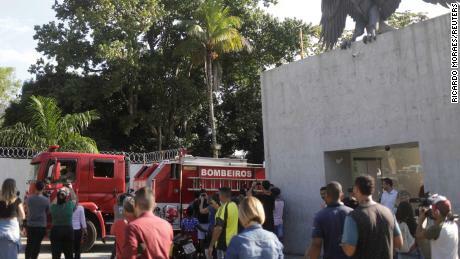 The fire occurred on Friday at the Ninho de Urubu training ground of Flamengo soccer club in western Rio de Janeiro, Brazil's Globo TV reported. Rio de Janeiro's governor, Wilson Witzel, has declared three days of mourning for the deaths of those affected by the floods and the fire, and and President Jair Bolsonaro issued a statement lamenting the fire had taken "the young lives at the beginning of pursuing their professional dreams". Zico, who is outside Brazil, wrote on Instagram: "What a shock getting this news here on the other side of the world", the former Brazil midfielder wrote. "May the Red-and-Black nation have strength and faith to get through this moment". Officials postponed Saturday's two semifinals of the Guanabara Cup, one of which was between Flamengo and Fluminense.